I hope you all had a wonderful weekend! I certainly did. It was so nice to get away and have some quality crafting time. I had decided that this weekend was going to be spent primarily on personal scrapbooking and not planning for classes. I finished quite a few pages for my cruise album, which I will post later this week or next - I just have a few things to finish up, like journalling and a title or two. I'm extremely happy with what I accomplished. 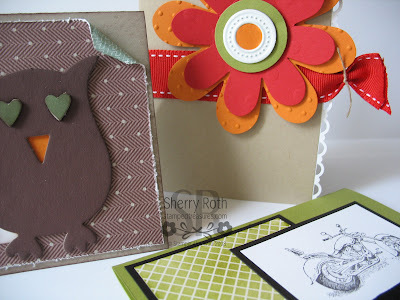 Today I am sharing a sneak peak of the cards we will be doing at this months Touch of Class. If you'd like to attend, please let me know. This is a great class for beginner and experienced stampers. Can't attend the class? Purchase the cards complete for $15 (plus $2.50 for shipping). Finished cards can be sent anywhere and can be requested until June 14th. Cards will be available for pick up or shipped on June 15th. Click here to view the most up-to-date last chance accessories list. Click here to view the last chance stamp set list. Click here to view the last chance definitely decorative list.